Hi, I'm Esme! Welcome to my place on the internet to share my artwork and inspiration. Today I'm going to share with you a new interest of mine, modeling miniature polymer clay food! I've been working with this new medium for about a month now, and I have really been enjoying it so far! This week I will be posting in more detail some of the miniatures I have been making, the miniatures you see on the dollhouse table in this photograph! What a great first post! Congratulations! I'm excited to check back to see the details of those delicious looking sweet treats! I was blown away by these yummy-looking treats! Thanks for sharing this new-found talent with us. 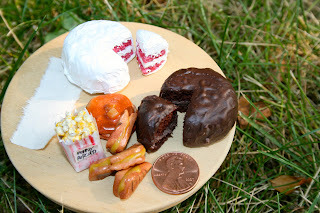 I am looking forward to seeing more polymer clay foods from you! Awesome! Can't wait to see what you come up with next. Very realistic!